I have read one news today about our former executive director Dennis Wise decision to defend Andy Carroll while he almost being offload by the club’s hierarchy. 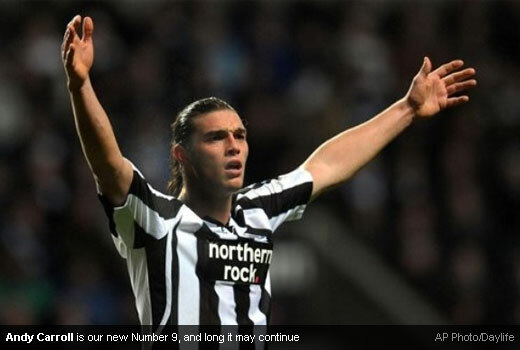 He also said that when Carroll would have been sold, he got him to sign a new contract for Newcastle United. Wise insists that he saw Carroll as the future of Newcastle United and now that boy has given the prove that Wise is right about him. Carroll has spent a six month loan with Preston North End during his early career with the Magpies. Scored his first Championship and English league goal, against Leicester City on 6 November 2007, before returned to Newcastle in January 2008. And now in just two years time, from a young lad who has been loaned and almost being dumped, Carroll has been our new number 9 and worn it with distinction. For me, Andy Carroll is the perfect successor and will continue the number 9 of Newcastle United traditions which need to have skill, pace, flair, power, strength, bravery, and creating alot of goals. He will definetely to follow the other Toon great number 9 players like Neil Harris, Hughie Gallacher, Albert Stubbins, Jackie Milburn, Len White, Wyn Davies, Malcolm MacDonald, Chris Waddle, Andy Cole, Les Ferdinand and Alan Shearer. So if any other club who has the interest to get him out of this club, they may have to think again and almost certain that they will failed. Some news has been reported the new interest from Spurs who were lining up a £20 million bid for Andy Carroll ahead of the January transfer window. To answer that news, Alan Pardew has expressed his determination to retain Carroll who has scored 10 Premier League goals this season.